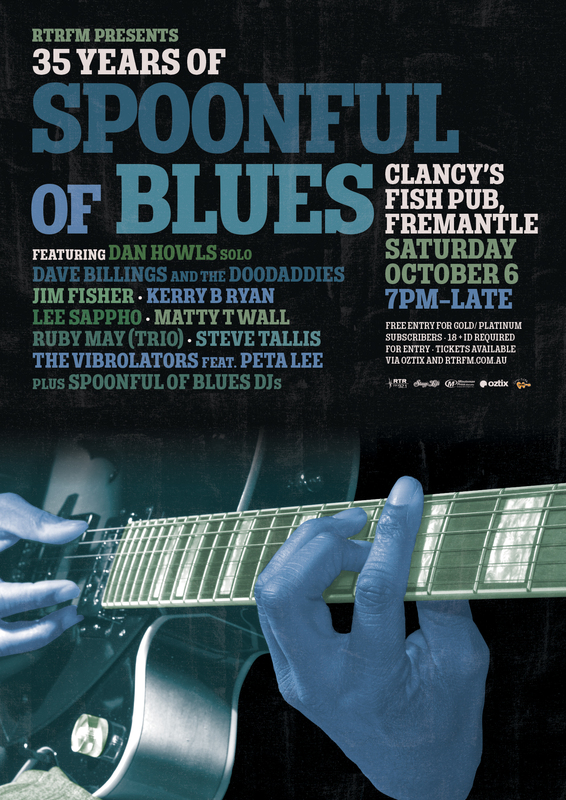 RTRFM’S ODE TO THE BLUES, 35 YEARS OF SPOONFUL OF BLUES WITH A HUGE PARTY AT CLANCYS FISH PUB, FREMANTLE. SATURDAY OCTOBER 6. From the deltas of Mississippi to the halls of UWA and now Mt Lawley, in 2018 one of RTRFM’s longest running shows, 35 Years of Spoonful of Blues and we will party with some of the finest blues players in Perth. Starting back in 1983 by local blues legend Steve Tallis the two-hour show, showcases of all aspects of the blues genre from the deltas, to the crossroads. If it sits within the 12 bars, Spoonful of Blues will play it. Join us at Clancy’s Fish Pub, Fremantle on SATURDAY OCTOBER 6th as we celebrate all things blues with two stages across the venue. In the main room you can catch the traditional blue sounds of The Vibrolators featuring Miss Peta Lee, the jumping rhythms of a former presenter Dave Billings and the Doodaddies, the soaring and majestically vocals of Perth’s first lady of the Blues Lee Sappho, a 20th century take on the blues from Matty T Wall and the amazing sounds of the founder of the show Steve Tallis. Outside in the courtyard you can see the stripped back sounds of journey local blues man Jim Fisher, the guitar maestro of Kerry B Ryan, the mesmerising vocals of The Ruby May Trio and the gravel voiced magic of Dan Howls. Plus, catch the DJ sounds of the entire Spoonful gang, Tamara Szep, Steve Pike, Dave McEwan, Rhyming Simon and The Purple One, Purple Pete for a night of raucous blues.